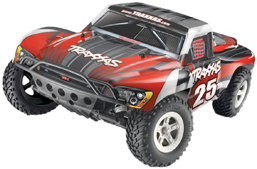 Traxxas Slash (2WD) was released in the second quarter of 2008. Right from the start the car proved its abilities to be used as do-it-all electric race truck. Race organizers understood Slash's potential and soon Slash Spec class (un-modified brushed Slash right out of box) was one of the most popular classes in club races. More advanced racers wanted their Slashes to have more power and Modified class was created. Success of Traxxas Slash led the way to nowadays well known Short Course class, also known as CORR (Championship Off-Road Racing). As Slash proved itself on track it found fans from bashers too. Huge jumps, back flips and wheelies combined with durable plastic made Slash good bashing car. Brushless VXL version is able to excess 60+ mph speeds! Slash is also very good "my first real rc". Plastic parts are durable and if they happen to break, they are cheap and easy to replace. Brushed version is fast enough for beginners with 30+ MPH top speed. 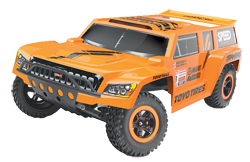 Traxxas Slash Rage was created to be a helpful source for Slash information. If you are thinking of buying Slash, make sure you read about different truck models. If just looking for solid starting setup, visit setups page.